A woman carries a sign remembering Maribel Trujillo Diaz, a Butler County woman deported in April 2017. May 1 is May Day, marked around the world with marches and protests for the rights of the working class. In Cincinnati, immigrants rights supporters marched to the Hamilton County Justice Center Tuesday demanding Sheriff Jim Neil stop coordinating with Immigration and Customs Enforcement (ICE) to deport immigrants. 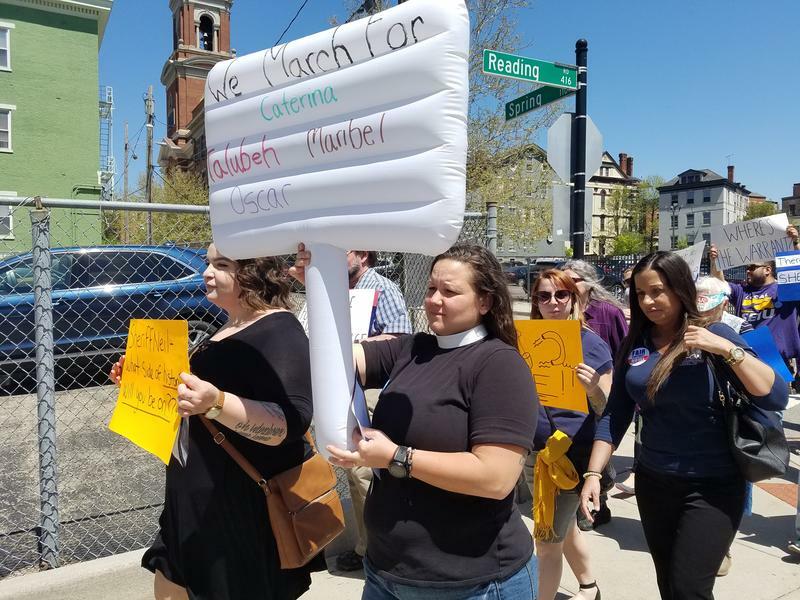 "Folks at the jail are going above and beyond the call of duty to be active in deported union members, church members and neighbors, and that needs to stop," says Director Brennan Grayson with the Cincinnati Interfaith Workers Center, which organized the march. Marchers carried signs and chanted, "When immigrant rights are under attack, what do we do? Stand up, fight back." They want the sheriff to honor the resolution passed by Cincinnati Council in 2017 naming Cincinnati a "sanctuary city." While the sheriff works for Hamilton County, the jail he oversees houses inmates for the city. 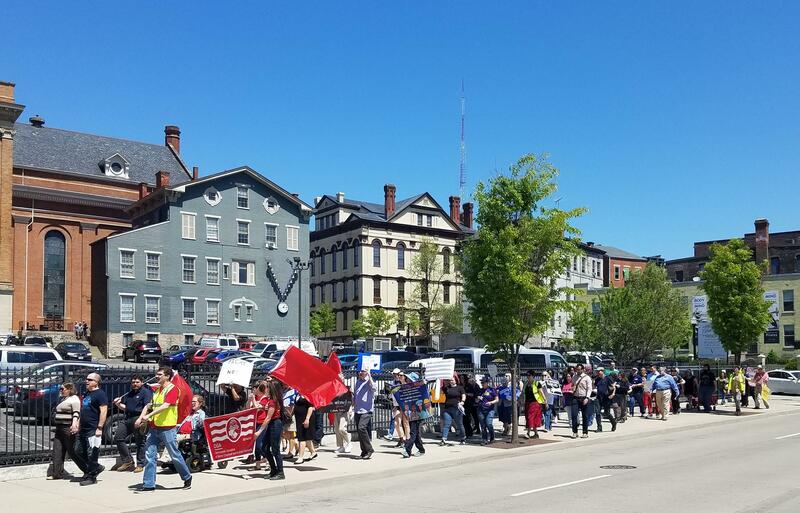 Supporter march from the Verdin Bell Center to the Hamilton County Justice Center on May Day, May 1. "Our immigration laws are civil laws, so why are we throwing the jail, the sheriff, the (Cincinnati Police Department), all of the criminal enforcement apparatus that we have to enforce the civil law? It doesn't make sense. It's not fair. It's not consistent. It needs to stop," Grayson says. A spokesman says the sheriff's department just follows the law. Sister Joyce Moeller participated in the march to show her support for "hard-working people who are trying to do the right thing, earn a living an honest way, and support their families." She says she's witnessed immigrants who are workers get picked up and thinks it's the wrong way to handle immigration issues. "It's just so unjust to deprive people in the spur-of-the-moment their way to make a living and take care of their families." The Sixth U.S. 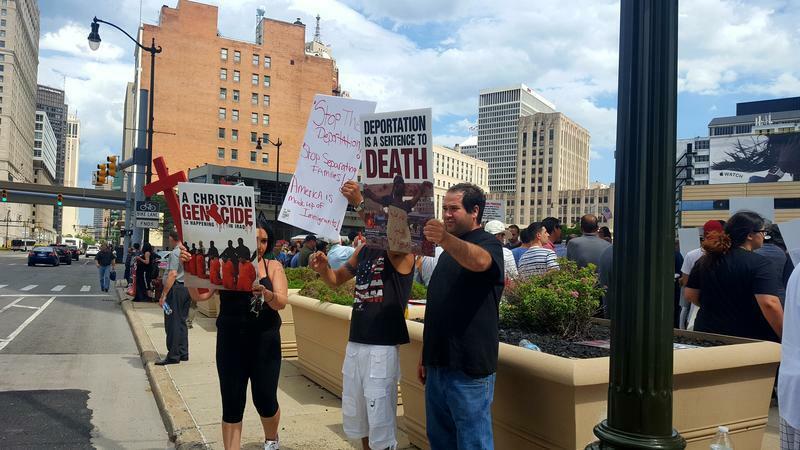 Circuit Court of Appeals in Cincinnati is considering whether the federal government should be allowed to proceed with deporting hundreds of Detroit-area Iraqis. Maribel Trujillo Diaz, the Butler County mother of four who'd been battling an imminent deportation order, has been sent back to her native Mexico.